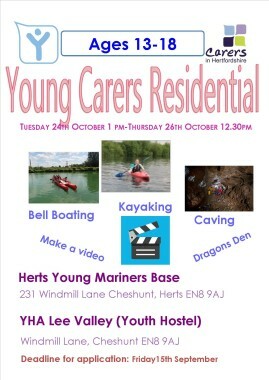 Carers in Herts Young Carers Team are running our second residential in October Half Term. This time it’s for 13-18 year olds. If you would like to come to this please see our flyer and send back an application form along with an annual consent form if we don’t already have one by Friday September 15th. We would like to understand more about young carer’s experiences of using services to support them in their young carer roles and have created a survey to find out more. This information will feed into the decision making process about how young carer services will be planned for the future so it is important that we get as much information as possible. To complete the survey please click here. The closing date for survey responses is 1st August 2017. We are really excited to be able to offer young carers aged 8 – 12 the opportunity to come on a residential break in Hertfordshire, on Tuesday 22nd August – Thursday 24th August 2017. Please note: there are limited spaces on this residential, and so there is an application form. 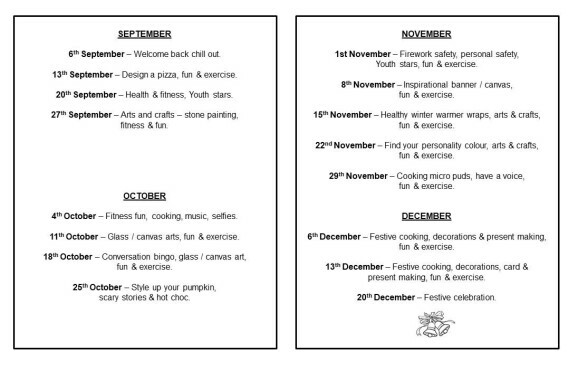 We have a busy summer ahead with lots of activities and projects for young carers. More information can be found on each activity in the attachments at the bottom of the page. Booking is essential for every event, and we will need an annual consent form for each young carer that would like to attend. Please contact us for more information if you are interested in any of our events. Come and learn life-saving skills on a First Aid course for young carers on Friday 4th August. Learn about resuscitation, recovery position, what to do in an emergency, and much, much more! This will be run by Critical Response. Meet other young carers and enjoy lunch together! 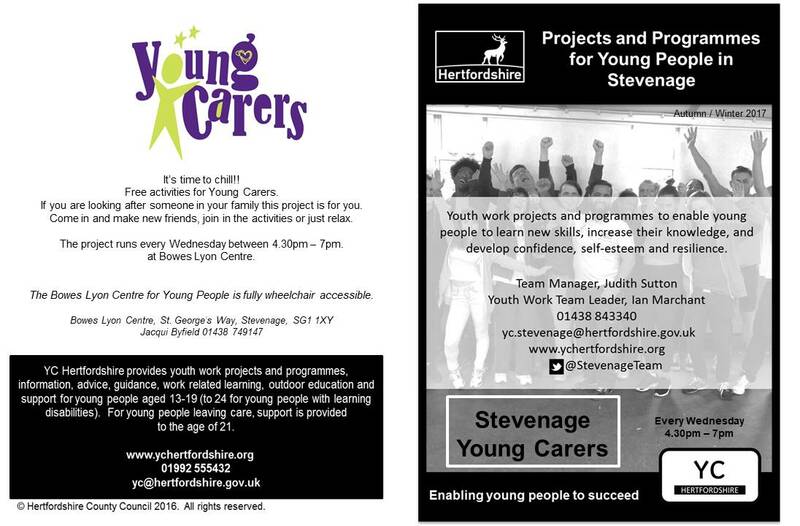 Try a 1 hour taster for young carers aged under 8 and their family members! Friday 28th July; various times throughout the day. Come to Fairlands Valley for our Summer Celebration for young carers aged 13 – 18. Take part in High ropes and Crate stacking, meet other young carers and have some fun! For young adult carers aged 16 – 25 we have a ski course every Wednesday evening during the summer holidays 6 – 8 pm. Running every Wednesday from 26th July – 30th August 6 – 8 pm. Please note: there will be a Carers in Herts staff member to greet young adult carers on the first week, and the final week. On other weeks you will be expected to arrive at the Snow Centre and go straight to the Snowbility Instructors. 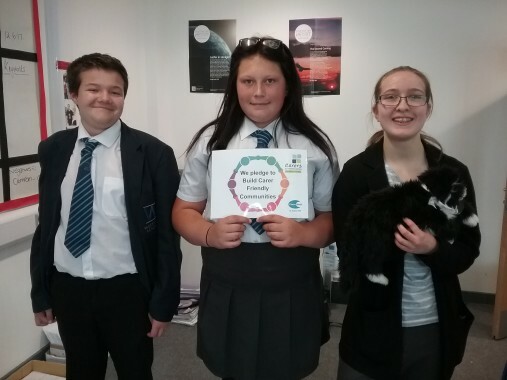 A huge thank you to 3 members of our Young Carers Council who got involved in Carers Week 2017. Carers Week is a national campaign to celebrate, recognise and raise awareness of Carers of all ages throughout the UK. 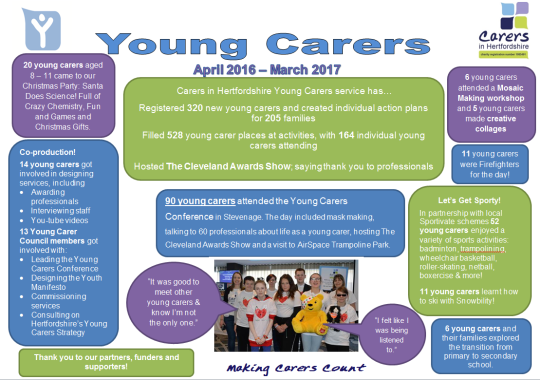 What is meant by ‘Young Carer’? 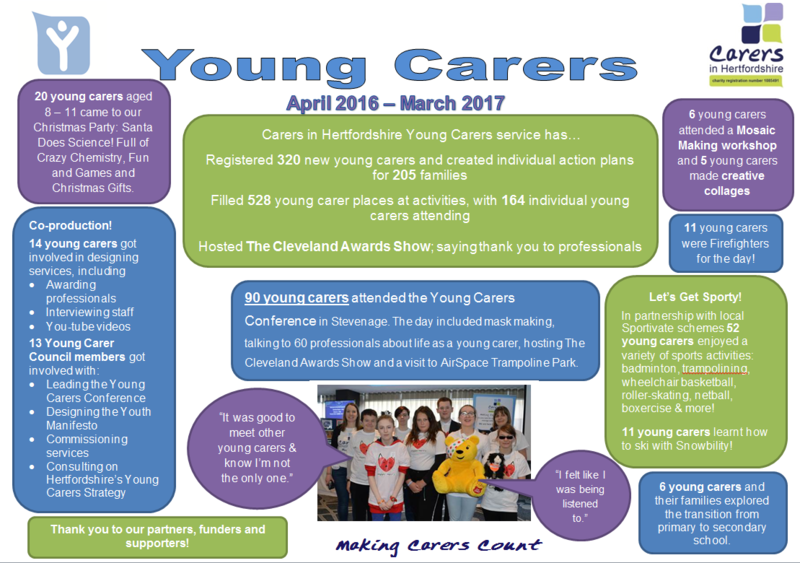 What impact does caring have on young carers’ lives? Westfield Academy pupils asked lots of brilliant questions, including ‘how do you know someone is a young carer?’ ‘do you ever resent the responsibility?’. Well done Annie, Rockee and Rachel and thank you to all at Westfield Academy for helping to build carer-friendly school communities!